The fine house is a classic example of architectural layering. The 1855 original house was built of timber framed Fachwerk, infilled with adobe bricks and hand plastered walls. The walls and floors are made from cedar trees planed on one side to accept the boards. In 1875 or so, an Italianate living room with bay window, and ell shaped porch and two bedrooms were added to the front. About 1910, the old outside kitchen burned, so a new one was added in board and batten style, with a side porch, which was later enclosed. 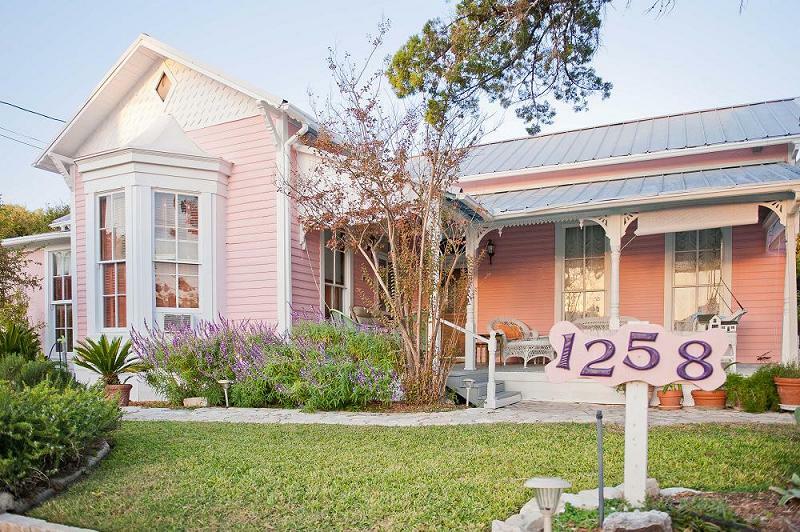 This charming small bed and breakfast is located less than 200 steps to Texas' Oldest continuously operating dance hall, Gruene Hall. In the heart of all the shopping and dining, you are steps to tubing on the Guadelupe river. Wineries abound and many tasting rooms are within a block or so. Festivals take place year round in the adjacent parking lot for Gruene Hall. The owner who restored this home, Cheryle Fuller, is also the town historian, and was instrumental in saving the community from demolition. She wrote the development plan, did the research to get the town listed on The National Register of Historic Places, wrote the deed restrictions' protective covenants (possibly the first in the nation), defended them in court, bringing the major networks to town to cover the lawsuit, organized the music festival to pay the legal fees and brought the TV stations back to cover the festival.